If you haven't come across a tiny home TV show or Buzzfeed article yet, let me be the first to introduce you to the concept of "tiny living." It's a minimalist lifestyle that's resonating with multiple generations, and some people are going so far as to ditch their four-bedroom homes and white picket fences for a mini-sized house on wheels. I spoke with several pioneers in the tiny house community: Mario MD Soto, who built his house entirely on his own and has what some might call the first "smart tiny house" (think wireless door); Alexis Stephens and Christian Parsons of Tiny House Expedition, who travel throughout the U.S. advocating for the legality of tiny homes (more on that later) while filming a documentary series; and Jenna Spesard and Guillaume Dutilh, who travel throughout the U.S. working freelance, teaching workshops, and documenting their journey on their website, Tiny House Giant Journey. Each tiny home tells a story about its owner(s)—how it was built, where it has traveled, and what purpose it serves. For Mario, he lost his house in the 2008 recession, and when it came time for him to buy a new house after paying off his debts, he looked for an alternative. Jenna and Guillaume didn't want the burden of a mortgage and debt, so they quit their 9-5 jobs for a tiny house lifestyle after Guillaume came across an article online that highlighted a tiny house. For Alexis and Christian, Alexis always loved the concept of small, simple, outdoor living and came up with the idea for the travel project to discover tiny home communities through research. All three tiny homeowners shared a willingness to downsize and a love of travel. Mario, who works from home for Apple support, says he always had a simple lifestyle, so the conversion to a tiny home was easy: "I would love to do a few months in different states … those main spots that you normally would only go for a week or do or a few days, I want to go there for a few months because I can, and really enjoy it." For Alexis and Christian the process was similar: "We found downsizing to be really liberating … there are certain rhythms that we learned when we first moved in that we're used to now, but at first was hard." Jenna and Guillaume also cite the freedom of their lifestyle as a motivating factor, as it allows them to pursue their dream of being travel writers and photographers. "When you're capable of taking a step back and realizing the benefits you get out of it, then those little issues disappear," says Guillaume. Jenna emphasizes the social aspect of tiny living in order to meet people. "People get really comfortable in their homes because they have everything there and it makes people sort of hermit like. If you're in a tiny house, you're the opposite of that." Each of the tiny house converts I spoke to have traveled across the U.S. and Canada, logging hundreds of thousands of miles combined. Jenna and Guillaume's tiny home even made some nautical miles aboard a ferry in Alaska's Arctic Circle. Since August of 2015 Mario has traveled more than 13,000 miles around the Western part of the United States; Alexis and Christian are currently on a 16,000-mile road trip across the U.S., stopping and filming in tiny home communities along the way; and since September of 2014, Jenna and Guillaume have logged 23,000 miles—which (unofficially) takes the cake for "most traveled house." When Mario went to register his tiny house in California, it was initially classified as a "travel trailer." And while it is a widely accepted lifestyle, legally you cannot live in a travel trailer full-time, so this makes tiny living a little tricky. Most tiny homeowners do live in their houses full-time and go anywhere from RV campgrounds to family and friends' land without a problem. But Jenna and Guillaume were given an eviction notice last year when parked on a lot in Denver because someone complained about their house in the neighborhood they were parked in. Jenna believes things are changing, though. "I think if the tiny house movement continues to grow and people continue to build these things … they're not going to tell 30,000 [or however many tiny houses there are] people that they have to destroy their tiny home on wheels." Alexis's and Christian's project, Tiny House Expedition, is dedicated to highlighting and legalizing this emerging lifestyle. Not only do they want to make tiny homes legal and accessible for everyone, they think they have a great potential to positively impact the homeless population and low-income areas. Fresno, California is the first official city to classify tiny homes as a secondary residence or "backyard cottage," which meets the basic requirements for full-time living; and Rockledge, Florida, now has regulations for tiny houses in two zoning districts. Mario thinks that once some states figure out how to identify exactly what a tiny home is, others will follow. "A lot of cities are waiting to see what others do. They're kind of like we don't want to be the first one. Let's just wait and see what others [come up with]." There are a variety of tiny house communities emerging as well, and Alexis and Christian plan on visiting most of them to include in their documentary short, "Living Tiny Legally," which will be available on their YouTube channel in August (as well as their feature documentary series that will come out sometime in the next few years). What Are They Like to Live in? Ranging between 100 to 400 square feet, one of the most fascinating parts of a tiny home is the creativity in fitting the necessities in such a small space. "Overall it feels like me and fits my personality … I've never lived somewhere where it's felt so much like me," says Alexis. Her favorite part of the house is the butcher-block countertop that Christian made with wood from trees that fell during a tornado in his hometown. Christian built about 80 percent of the house over the course of nine months with help from a carpenter whose property they built it on. One of the best parts for the couple is "really tailoring for how you live your life. It's not doing without or depriving yourself—Christian made sure to build a big shower—it's just really boiling down to the essence of what you really love or need and how you use your space," says Alexis. Mario built his house completely on his own, and included a lot of technical features like saltwater batteries, wireless lights, a skylight, air conditioning, and a wireless door. "I can control almost everything from my phone," he says. Going green wasn't his motivation, but that lifestyle fit well with tiny living. Guillaume and Jenna also built their home on their own, although they hired an electrician and plumber for certain things to make sure it was done right. "We really love having that little thing [front porch] on the house that makes the house look more like a house," says Guillaume. And while both love being outside, Jenna also appreciates their projection TV. "It's Oscar season and I have a film degree and love movies, so we're trying to watch them all." The average cost of a U.S. home is $341,500, while a professionally built tiny house averages around $47,500, and a personally built tiny home costs around $27,500, according to Dow. If you're fascinated by tiny living, there's a handful of TV shows out there (Jenna and Guillaume recently filmed Mighty Tiny Houses on HGTV) that will give you a glimpse into tiny living. And companies like Tumbleweed are dedicated to building tiny homes. To follow any of these tiny homeowners' journeys or see a tiny home for yourself, check their social and YouTube channels and be sure check out Colorado Springs' Tiny House Jamboree, where Jenna and Guillaume will be speaking in August. 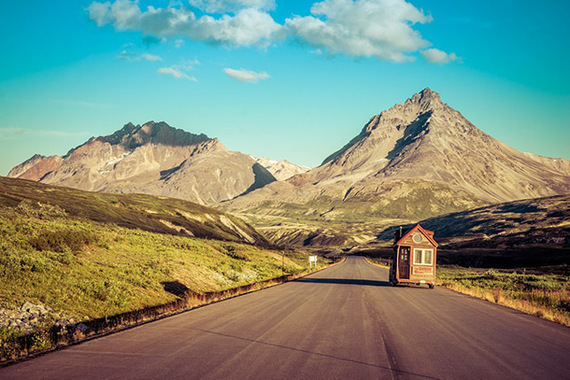 Read the original story: What It's Really Like to Live and Travel in a Tiny House by Ashley Rossi, who is a regular contributor to SmarterTravel.